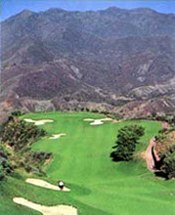 Golf holidays & breaks in Marbella, Spain. Marbella and the Costa Del Golf, the home of great golf breaks in Spain. Spanning the breadth of the Costa del Sol offering golf package holidays, pre-booked tee times, car hire, chauffeur driven coaches, hotel and self catering accommodation, weekly golf competitions, gala weeks and specially tailored corporate events. Email us with your golf holiday requirements here!